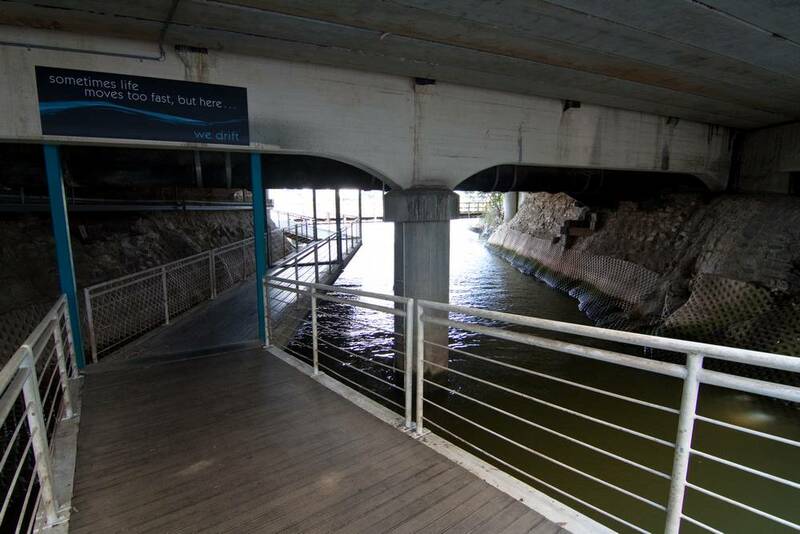 The Western Creek floodgate: a reality after 125 years | There once was a creek . . . But the idea didn’t die: it resurfaced after every flood, only to recede again with the memory of the floodwaters. It probably sunk into near-oblivion after the completion in 1985 of Wivenhoe Dam, which — if you believed the real estate industry — was supposed to save Brisbane from ever flooding again. 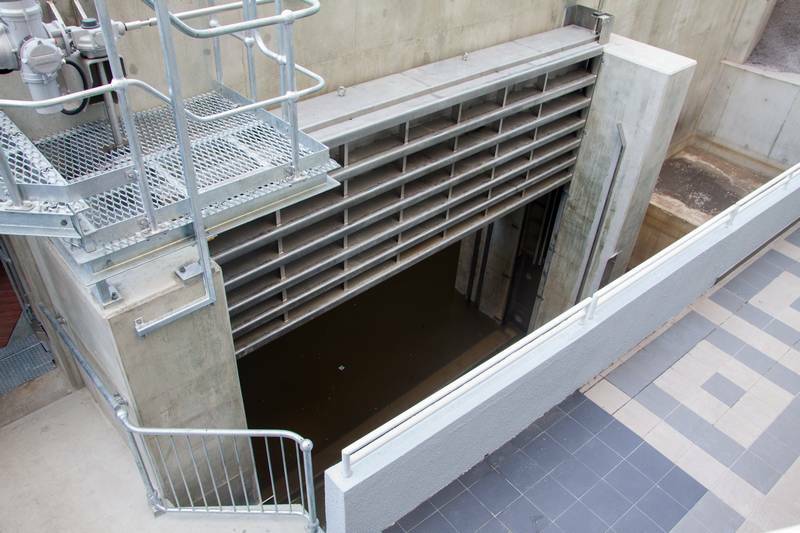 But when the flood in January 2011 proved — unless you believe the real estate industry — that Wivenhoe Dam is not a bottomless pit after all, attention turned once again to more localised methods of flood mitigation. 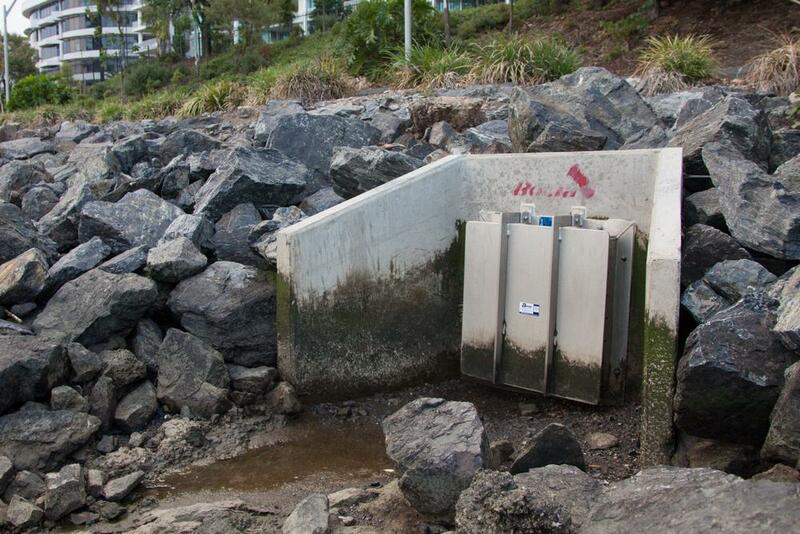 The Brisbane City Council commissioned a study into backflow prevention, and since 2012 has been rolling out the installation of floodgates — more properly known as backflow prevention devices — at prioritised spots along the river. A duckbill valve on the riverbank at Milton. The devices installed so far generally match one of two descriptions: flapgates, which look and function just as you might expect; and duckbill valves, which look vaguely like a duck’s bill but in fact function more like a duck’s bottom, allowing stormwater to flow out while preventing any floodwater from coming in. The size of the devices varies depending on the dimensions of the outlet being sealed. 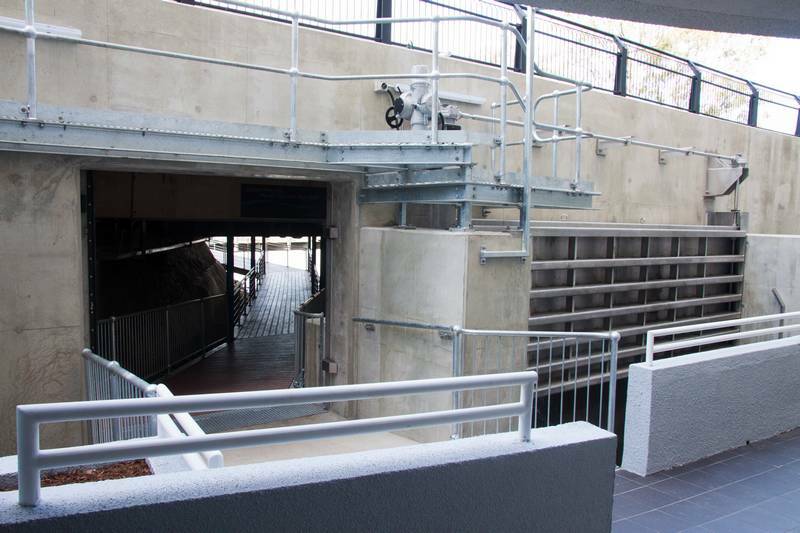 Most devices, like the flapgates and duckbills at Milton, are of fairly modest proportions, while others, such as the enormous duckbills at Leybourne Street in Graceville, are heftier pieces of engineering. 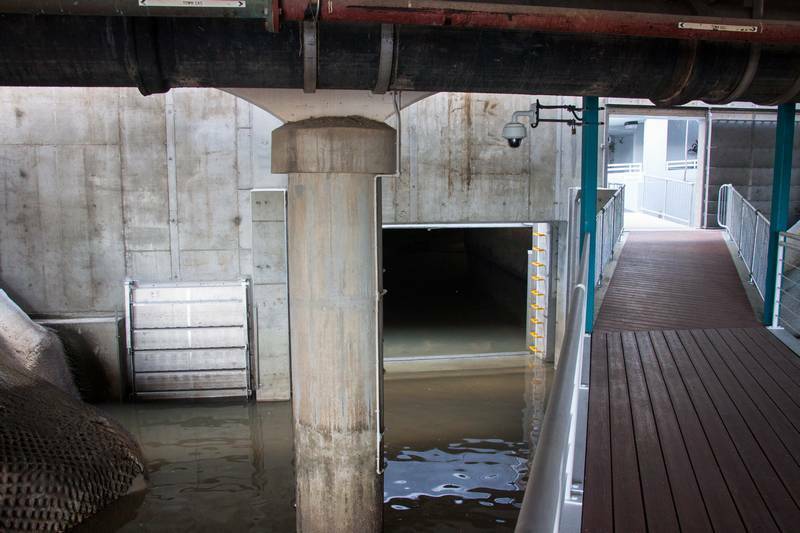 But the floodgate at Western Creek is, as far as I know, in a class of its own. It is both bigger and more complicated than any of the other devices that I have seen. In designing it, the City Council (or their consultants) has had to overcome several challenges specific to the Western Creek outlet. 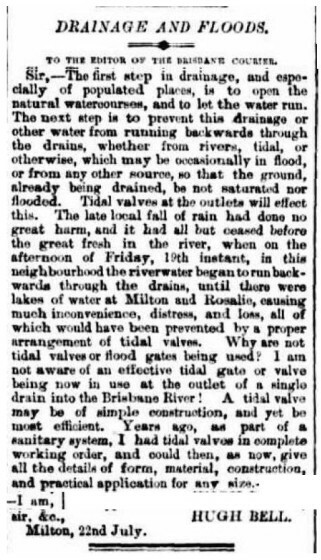 The first challenge is that the cavity formed by the channel of the creek and the road above it is large and irregularly shaped: this is no mere pipe to which a simple flapgate or duckbill can be fixed. Making things harder still is that this space houses a public walkway leading from the bike track to the John Oxley Centre on the other side of the road, so any kind of permanent barrier would result in this pathway being lost. Another reason to avoid a permanent barrier is that it would have ended the regular tidal flow of water into the Milton Drain, which is open to the air along most of the distance between the John Oxley Centre and Milton Road. Perhaps this is just an aesthetic consideration, but I for one would have been disappointed if a floodgate prevented the Milton Drain from filling up twice a day with the silty brown cordial of the Brisbane River. 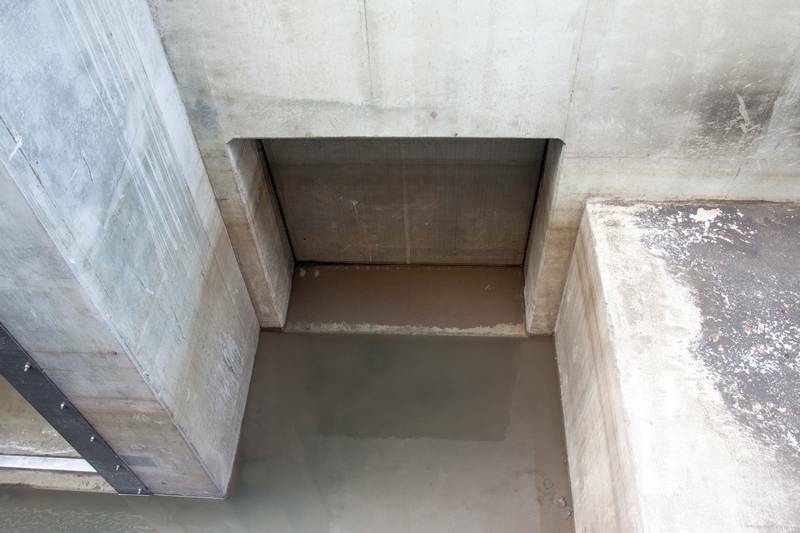 The council has solved these challenges by sealing off the cavity beneath the road with a huge concrete wall in which there are three separate openings, each with its own floodgate. The main opening, shown in the two images below, can be sealed off with a descending steel gate — I believe this construction is called a penstock valve. The view looking down on the main floodgate — a large penstock valve that will be lowered into position when the river rises. The main gate seen from the walkway under Coronation Drive. The second opening is the entrance to the walkway. 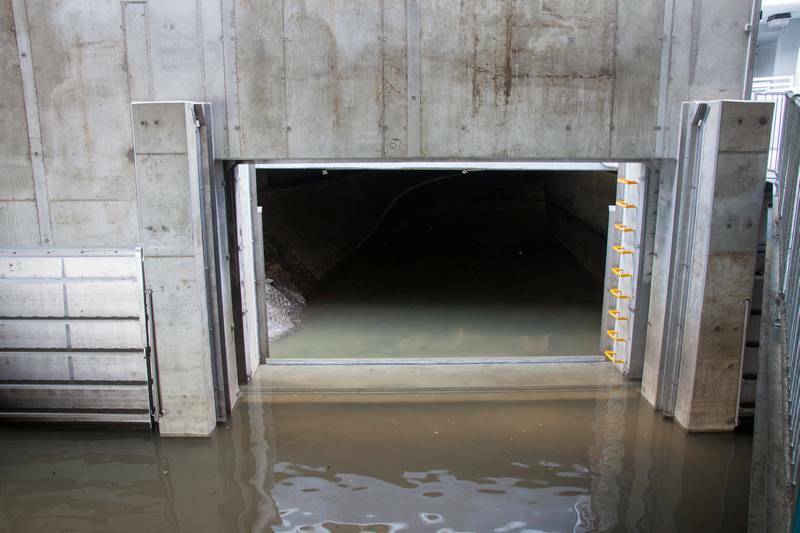 In the event of a flood, this opening will be sealed with a sliding steel door, which can be seen in the second of the two images below. On the edge of this door, I noticed a label showing the manufacturer and specifications of the device. 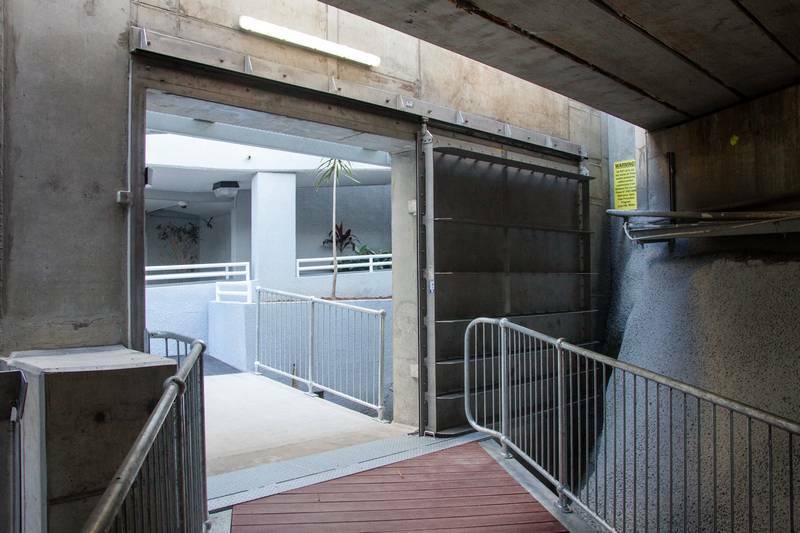 A view of the main gate (right) and the entrance to the pedestrian bridge, which can be closed off by a sliding door. The entrance to the footbridge as seen from inside. The flapgate as seen from outside. The third and smallest opening is covered by a steel flapgate configured to allow water to flow from the drain into the river but not in the other direction. 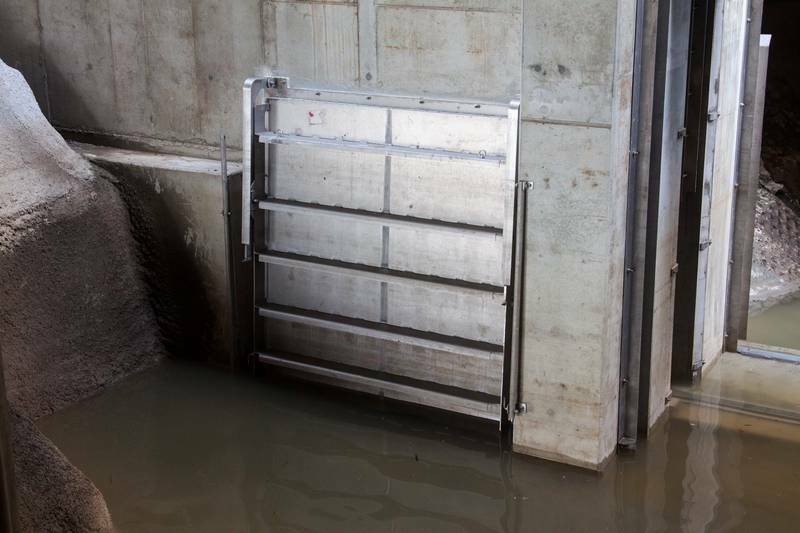 This gate will work only as long as the water flowing through the drain exerts more pressure than the water on the other side pushing the flapgate closed. Once the river reaches a certain height, the stormwater will have no way out of the Milton Drain except to spill over the edges or make its way up through the gutters and grates. 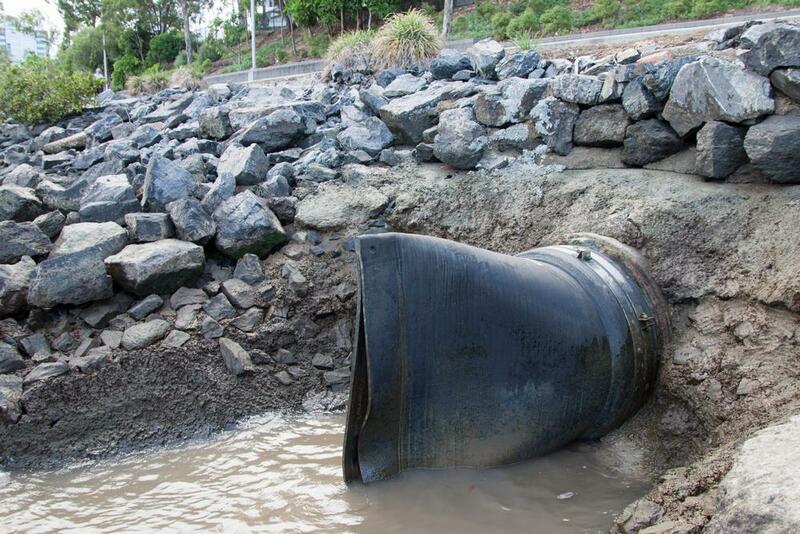 The same dynamic also applies in all of the other drains in Brisbane with flapgates and duckbills installed. This might seem like a system designed to prevent one form of flooding (backflow flooding) at the expense of exacerbating another (stormwater flooding) — and to some extent, it is. But the trade-off has been carefully judged. In every account that I have read of a major flood event in Brisbane, the rise in the river comes after the local rain has passed. (This is exactly what happened in 2011: I can still remember waking up on the morning of 12 January to find most of Rosalie underwater and the sky above brilliant and blue, clearer than it had been for weeks.) So the peak flow of stormwater is unlikely to coincide with the peak flow of the river; and even if it does, the resulting local flooding would be no worse than what would have occurred without the floodgate. The flapgate seen from the inside. All three floodgates seen from the footbridge. So, there you have it: the future of Western Creek is here. It looks nothing like what the Toowong Shire Council would have built all those years ago had been able to implement its drainage scheme in its entirety (that scheme would have covered Western Creek completely and turned the outlet into a culvert), but the intended outcome is the same: unless the next flood is really, really big — big enough to spill over Coronation Drive — everything between Rosalie and the river will stay dry.2 This is great news for Milton and Rosalie residents, but as with most things, there is no free lunch: the water that would otherwise have flooded Milton, Rosalie and any other suburbs now protected by floodgates will instead remain in the river and exacerbate flooding somewhere else. I have no clue about which specific areas might be affected in this manner, or how significant the effect might be — but I sure hope that someone else does. 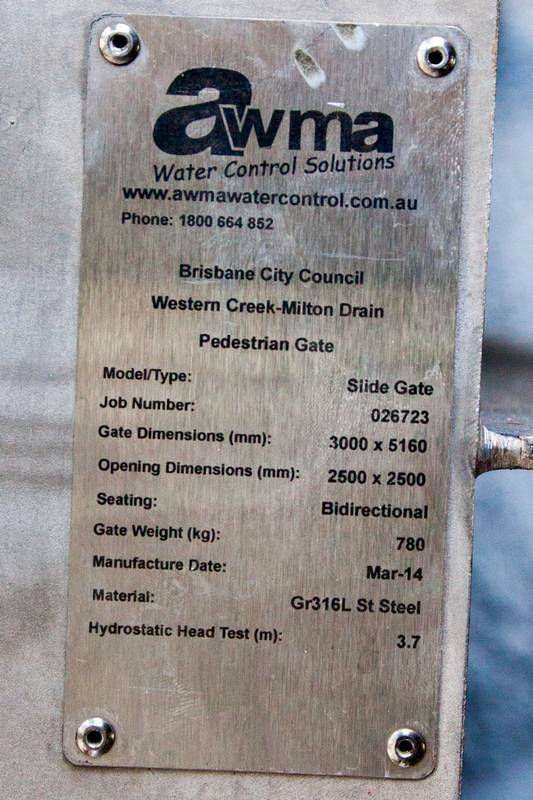 This entry was posted in Short articles and tagged backflow, flood mitigation, floodgates, floods, western creek by angusv. Bookmark the permalink. I’ve been waiting expectantly for an update on the new floodgate. You’ve taken some very good photos which actually show more detail than I could see without the aid of a flash. It is rather gloomy otherwise. I would be interested in knowing how the reduced opening will affect the quality of the water in the drainage system. Do you think there would be reduced flow or a build up of debris?